Source: Mennonite Historical Society of BC Archives: S20.2-2010.087.006. 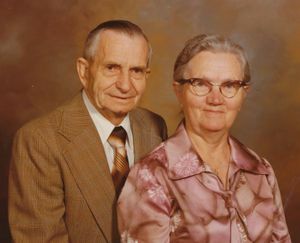 Peter Froese: pastor and farmer; born 25 March 1908 in Rosengart, Chortitza Mennonite Settlement , South Russia to Johann Froese (25 October 1876 - 23 January 1920) and Maria (Driediger) Froese (12 April 1876 - 20 April 1914). He was the fourth child in a family of three sons and two daughters. On 16 June 1934 Peter married Tina (Allert) Penner (29 October 1909 - 2 August 1989, Mission, British Columbia, Canada), daughter of Franz and Katharina Allert of Elizabethal, Chortiza, in Tofield, Alberta. Peter and Tina had eight children: Wanda, Rudy, Werner, Victor, Terrance, Eric, Lillian and Arnold. Peter died 12 July 1994 at the Menno Home, Abbotsford, British Columbia. In 1926 Peter Froese immigrated to Canada with his younger brother, first settling in southwest Manitoba. On 30 June 1929 he was baptized by Elder J. P. Klassen near Willen, Manitoba, and became a member of the Schoenwieser Mennonite Church in Winnipeg, Manitoba. In 1930 Peter moved to New Brigdon, Alberta, and lived in Ryley near Tofield, Alberta from 1933 until 1947 when Peter and his family moved to Mission, British Columbia (BC). He retired to Abbotsford, BC in 1985. The Revolution in Russia disrupted the formal education Peter desired. His goal was to be a teacher. Following his move to Canada, opportunity for formal education ended. In the mid 1950s he was able to attend some sessional courses in Chicago. Peter's first love and enjoyment was the Church. He was involved in the founding of Schoenseer Gemeinde (Tofield Mennonite Church) in 1936. He was elected as a ministerial candidate in 1936 and ordained in 1939 by Elder C.D. Harder of Rosemary, Alberta. Froese was the leading minister of the United Mennonite Church (Cedar Valley Mennonite) Mission, BC from 1948 until 1964. During the same period he was active in the Conference of Mennonites of BC as chairman, vice chairman, and a member of the Missions Committee. For nine years he served on the board of Canadian Mennonite Bible College (now Canadian Mennonite University). Froese served congregations on an interim basis in Chilliwack and at Greendale First Mennonite Church from 1967 until 1968. From 1968 until 1973 he served as the Conference of Mennonites in BC Conference Pastor. The principle focus of his life was to serve his Lord. His motto, "Here am I, send me" was exemplified in his openness to the active leading of the Holy Spirit. He read the Word of God desiring to share the message with the Church and the world. His preaching tended towards an inner dynamic, emphasizing evangelism and consistent spiritual living. During the 1950s, when many churches resisted changing from German to English, Froese embraced the linguistic transition, preaching his sermons in English in his later years. Froese, Werner. "Froese, Peter (1908-1994)." Global Anabaptist Mennonite Encyclopedia Online. July 2005. Web. 24 Apr 2019. http://gameo.org/index.php?title=Froese,_Peter_(1908-1994)&oldid=132755. Froese, Werner. (July 2005). Froese, Peter (1908-1994). Global Anabaptist Mennonite Encyclopedia Online. Retrieved 24 April 2019, from http://gameo.org/index.php?title=Froese,_Peter_(1908-1994)&oldid=132755. This page was last modified on 13 November 2015, at 00:24.